If there ever is a time you are in search of a good Chocolate Cake Recipe, you can stop looking because this is it. By far, the best chocolate cake/make it from scratch/stay moist for days cake I have ever had. I think it is the addition of coffee and since you have heard of my love of coffee in the past, this probably does not surprise you. This cake can be made in a 9 x 13 cake pan or 2 - 8 inch or 9 inch rounds and will all turn out awesome! As I have been informed, it's so good, people will be licking the plate clean when all the cake is gone! As for the shape, I found a print out online for a guitar and used it as a format for the shape that I wanted. Easy as pie...I mean cake! Preheat oven to 350 degrees. Grease your pan(s) and coat with cocoa powder. I have used 2-9 inch rounds or a 9x13 rectangular pan for this, but you could also turn this into cupcakes if you would like. In a separate bowl, combine buttermilk, oil, eggs and vanilla and whisk until just incorporated. With a mixer on low speed, slowly add the wet ingredients to the dry ones. Keeping the mixer on slow speed, add the coffee and stir just to combine. Pour batter into prepared pans and bake for 35-40 minutes, until the cake tester (or toothpick) comes out clean. Cool pans for 30 minutes and then turn cakes on cooling rack to cool completely. Recommendation: Freeze your cake at this point if you are not serving the same day. 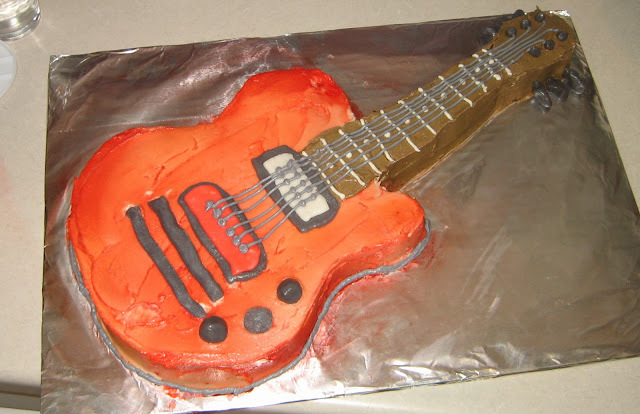 It allows for easier frosting and decorating and keeps the cake fresh. 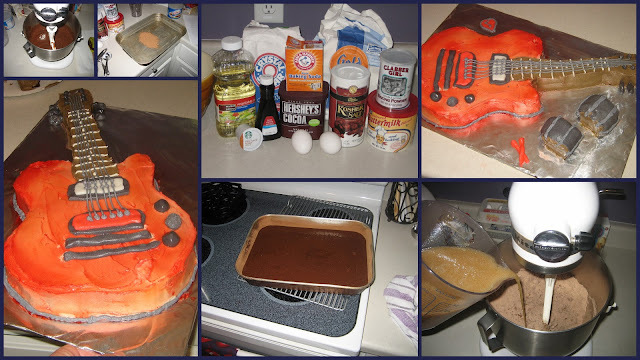 I have to give credit where credit is due...this awesome recipe came from: i am baker website, which I stumbled upon while looking for an amazing cake to make for my friend's son's Rock & Roll Birthday.